Red All-round Package. The new red EasyNote TR13HR is equipped with an Intel i5-2450M and a dedicated Nvidia GeForce 630M graphics card, both of which should provide sufficient performance and battery runtime alike. On top of this Packard Bell also supplies an abundant software package for the notebook. A thorough success or rather a bad compromise? The EasyNote notebooks from Packard Bell are known for being all-rounders with a conspicuous design. Its predecessor, the EasyNote TS11 HR-040UK, already came equipped with an Intel i5 processor. The manufacturer isn't stingy when it comes to the components of the EasyNote TS13-HR-197GE either: At the heart of the notebook is an Intel Core i5 2450M, which has a base clock speed of 2.5 GHz, but can be overclocked to up to 2.8 GHz with Turbo-Boost. 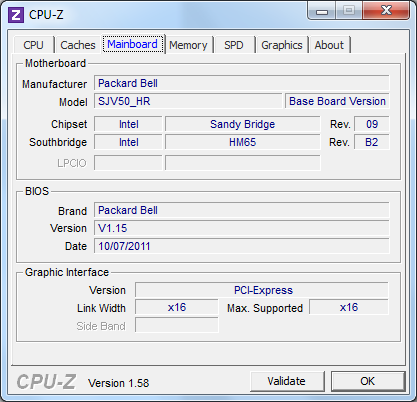 For simple applications the Intel HD Graphics 3000 graphics unit integrated into the processor is used, something that makes itself noticeable with a relatively long battery life. 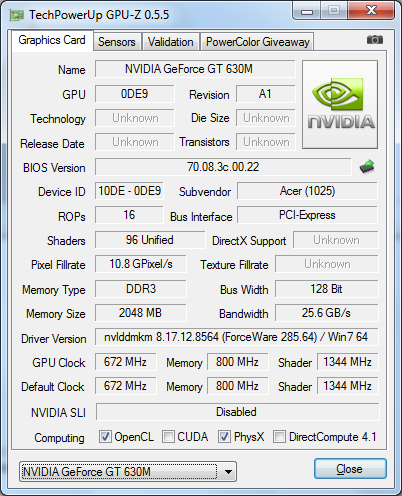 For games and other demanding applications, the dedicated Nvidia GeForce GT 630M graphics card with 2 GBytes of memory is available. Even the 4 GBytes of RAM should still be enough for demanding users these days. Acer has included the same processor and dedicated graphics card in the TravelMate 5760G-2454G50Mnsk, which we also reviewed recently. Due to this, we aren't only interested in finding out how the EasyNote TS13 compares to its predecessor, but also to what extent it is better than its direct competitor. At first glance the bright red design of the EasyNote stands out: The palm resting area, as well as the shiny display lid, are covered in red with a decent pattern. 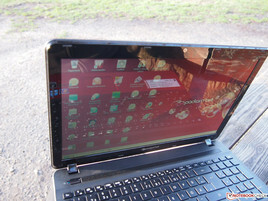 As its predecessor, the EasyNote TS11-HR-158GE, the TS13 is housed in the same case as the Acer Aspire 5741G-334G50Mn. The main difference is the shiny lid material, which is unfortunately susceptible to smudges and fingerprints. As with the Acer, the lower edges of the display lid are missing the rubber dampers for which sockets are available. The missing dampers don't lead to any scratching though, contrary to the results determined during the Acer test. The Packard Bell model is fitted with four rubber dampers at the top of the display, one on either side, and two at the bottom, all of which should protect the screen sufficiently when closing it. With the exception of the silver logo, the whole notebook is constructed of plastic materials, which have generally been well manufactured, and also make a relatively stable impression. Thus, the base unit hardly warps with pressure applied, and the internal parts are therefore sufficiently protected - not least because of the stable base plate. The display hinges hold the display firmly in all positions, and allow it to be opened to up to about 160 degrees. In addition, we were also not able to find any partially loose components. Underneath a screwed down panel on the bottom surface, is the internal hard drive, as well as the RAM and the WLAN module. Along with a precision screwdriver, you will also need a bit of skill to open the panel without damaging it: This is due to the panel being relatively firmly attached by a series of hooks on its sides. If wanting to remove the battery, a little help will also be required in this case - a sharp utensil is needed for pushing it out. With frequent use this is likely to lead to signs of wear. The fact that this can also be possible without a screwdriver, was proved by us during the review of the HP Probook 4535s. The battery and maintenance panel on the bottom could be removed with only two sliders and without any tools, and nevertheless it sits firmly in the chassis. 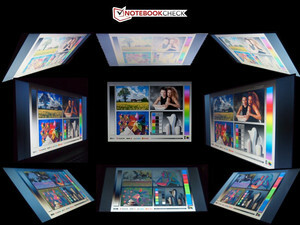 The interfaces are the same as those available on the predecessor EasyNote TS11-HR-040UK. On the left side are the two audio mini-jack sockets as well as a USB 2.0 port, and the HDMI and VGA ports provide options for connecting external monitors or a projector with Full-HD resolution. Next to the air vent are also the Gigabit Ethernet port, and the power input. On the right side, the Kensington Lock slot, as well as the DVD burner, and another two USB 2.0 ports can be found. The latter of these are relatively close together, which is why it could lead to difficulties attaching two USB connectors at the same time if these are a bit wider than usual. Another shortcoming is the missing USB 3.0 port, which is quite common in the mean time, and is even included in some more affordable models. Packard Bell has been stingy when it comes to the (hardware) accessories. Along with the obligatory AC adapter and the battery, there is merely a printed product manual, which is also available as a PDF version by pressing the F1 button, included in the delivery. This shouldn't be satisfactory for anyone other than notebook beginners. What is abundant in contrast, is the software included by Packard Bell for the EasyNote TS13. The highlight is the pre-installed full version of Adobe Photoshop Elements 9. Software, that should more than suffice for image editing by a home user - even if the current version of the program is version 10. With Nero Suite, there is also a burning program available, and Microsoft Office Starter provides free, although with advertising banners, basic text processing and spreadsheet applications. An all-round and free solution without advertising could also be provided by Office Suite or LibreOffice, which could be installed retrospectively if necessary. The obligatory 1.3 Megapixel webcam is also integrated into the display frame. In this case an LED is missing for indicating whether the webcam is active. On the software side, there is also no function such as a tray icon available, which signals the activity, or with which the module can be deactivated. For example when using Skype, we would recommend deactivating the automatic transmission of the video images in the settings, in order to prevent accidental surprises. Except for hard wired Gigabit Ethernet, there is also a WLAN module available, which supports the current standards 802.11b/g/n, and should thus at least theoretically provide a bandwidth of up to 600 Mbit/s wirelessly. There may be enough space for a UMTS module in the case, but there is unfortunately no socket available, something that is nevertheless not uncommon with notebooks in this class. What would be common is Bluetooth, something that we are missing with the EasyNote TS13. In this case an external solution via USB would also be an option. Packard Bell provides a standard 12 months warranty with mail-in or carry-in service, which means, that customers have to return the device or take it to a licensed retailer in case of a problem. This constitutes the absolute minimum as far as notebook warranties go - other manufacturers often provide a 24 months warranty with pickup & return service for notebooks in this class, in which case the notebook is collected and returned. At least Packard Bell provides a warranty extension of up to 3 years with pickup & return service for 69 Euros, which also includes all hardware faults. As with its predecessor, the EasyNote TS11-HR040UK, the TS13 also comes with a keyboard using a chiclet design. With the exception of the top and bottom rows, the keys have the usual 15 x 15 millimeter dimensions, and a pleasant 3 millimeter gap between each other, which combine to allow for fast typing. The keys in the bottom row are about 18 millimeters high, while the function keys on the top row are only about 9 millimeters high, something that doesn't lead to a compromised typing feeling though. Users that are not used to key combinations with the function keys, will be much more annoyed by the hotkey functions that are active as standard, whereby F1 to F12 have to be used together with the Fn key. In the BIOS you can restore the usual functionality by changing its settings. Along with the usual hotkey functions, such as switching between monitors, or switching the WLAN on or off, there are also some exotic options available: Using the F1 key for example, the product manual can be opened as a PDF - reserving a single key for this seems a little exaggerated in this case; a simple shortcut on the desktop would also have sufficed. At the top right of the notebook is the so called Social-Media button, which opens a Facebook messenger that initially reminds of ICQ, and also provides access to YouTube, Flickr, and Twitter. Also above the numeric keypad are the buttons for the volume control, which are easy to operate, and provide a useful addition to the hotkey portfolio. More or less all the hotkeys provide an indication on the display when used, just unfortunately not the one for setting the brightness of the display. In this case this means that users will have to orientate themselves by the highest or lowest setting. With 87 x 46 millimeters, the touch sensitive area of the lowered touchpad area has sufficient dimensions. Even with a dry index finger, the gliding properties of the smooth surface are sometimes a little sticky. Nevertheless, the cursor control is generally good. What should also be mentioned, is that the two mouse buttons don't generate a loud click, as is the case with some other notebooks including some from the mid-range. On the right edge is a scroll bar, which can easily keep up as a replacement for a mouse wheel. 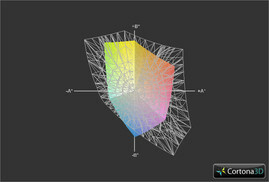 Other multi-touch gestures are more practical, such as for example, zooming, turning, or drag'n'drop. 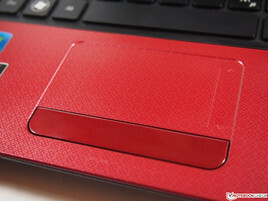 What is also practical is the palm detection, which is supposed to prevent accidental touchpad commands. It can be configured in the sensitivity settings of the touchpad menu. 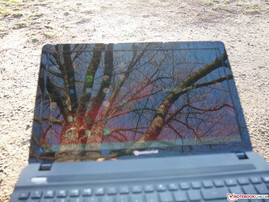 The Packard Bell EasyNote TS13-HR-197GE contains a 15.4 inch reflective display with an LED backlight. With a native resolution of 1366 x 768 pixels, and the resulting 16:9 aspect ratio, HD videos (720p) can be displayed. A Full-HD resolution is achievable using an external monitor. These characteristics are in line with those that can be expected from displays in this price and value range. Also the unspectacular laboratory measurements confirm the average quality of the display: A brightness of 194 cd/m² to 212 cd/m², with an average of 200 cd/m², is also "OK", while the contrast of 161:1 is below average compared to similar devices in this class, and the black level of 1.27 cd/m² is a little above average. Nevertheless, none of these values stand out as being excessively detrimental. 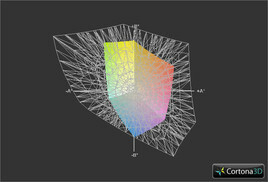 An especially large coverage of the color space is merely a must have for professional graphic designers of image editors. For the sake of completeness the color space of the EasyNote TS13 was also tested, and led to results which fulfilled our expectations: Compared to the often used sRGB color space the EasyNote is on the weak side. 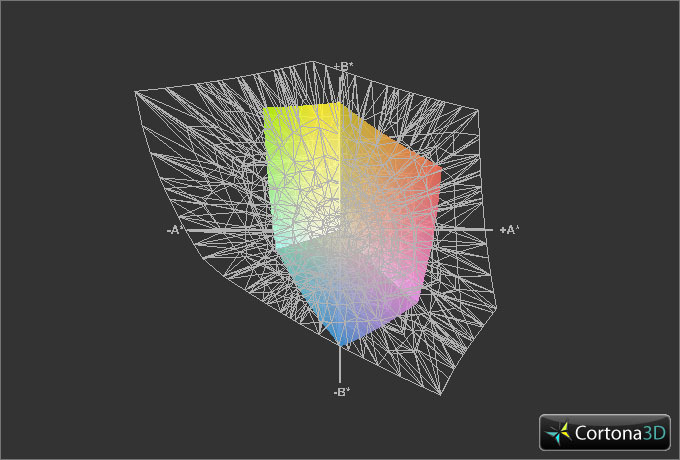 When it comes to the AdobeRGB color space, it doesn't even nearly come close, as with all other notebook displays in this price range. For use outdoors reflective displays are generally worse than their matte counterparts by a long way. Permanent reflections can also be compensated for with a higher display brightness, which however reduces battery life. We will elaborate on this topic later in the review though. With the previously mentioned average brightness, the EasyNote TS13 unfortunately isn't able to counteract the reflections on its display. With the Glare-Type display adopted for the EasyNote TS13, the horizontal viewing angles have a relatively good stability, while the vertical viewing angles noticeably invert and change from 45 degrees. These viewing angles are in line with our expectations, since hardly any better displays are available in this price range. 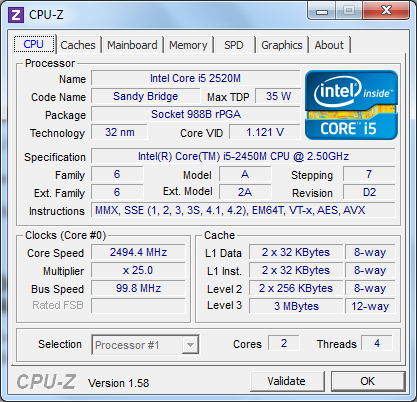 The Intel Core i5-2450M adopted for the EasyNote TS13-HR-197GE, belongs to the upper mid-range of processors. With a base clock speed of 2.5 GHz, and a maximum performance of 35 Watts, this corresponds to the usual performance in this class. 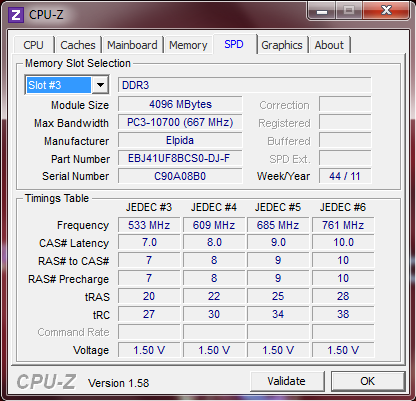 Thanks to Turbo-Boost the two cores of the CPU can be overclocked to 2.8 GHz, or one core can be overclocked to 3.1 GHz. 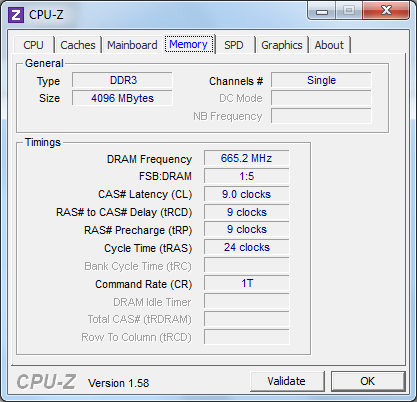 In cases when the notebook is operating with a low processing load, the processor speed is on the other hand automatically reduced to a frugal 800 MHz. The 32 nanometer processor is equipped with a decent 3 MBytes of Level 3 cache, and has two additional virtual cores available thanks to Hyper-Threading, which is why four cores are displayed in the Windows Task Manager CPU Usage graphic. 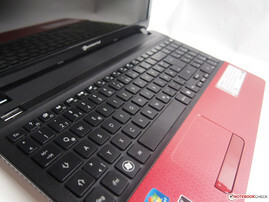 In order to achieve a good compromise between performance and battery life, Packard Bell adopted the Nvidia Optimus Technology for the notebook. This allows the HD Graphics 3000 graphics unit integrated into the processor to be used for leisurely applications, while demanding 3D applications such as games can switch to the dedicated Geforce GT 630M graphics card. 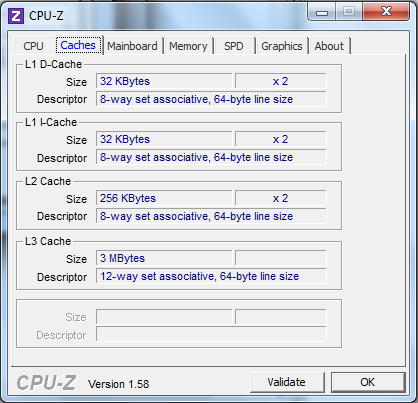 The performance of the dual-core processor was determined using Cinebench R10 and Cinebench R11.5. What is especially interesting is the comparison with the shortly reviewed TravelMate 5760G-2454G50Mnsk, which has the same processor and graphics solutions, and is also in the same price range - the only difference is 1 GByte of graphics memory. With the R10 benchmark the EasyNote TS13 edges slightly ahead of the Acer model, just like its predecessor EasyNote TS11 HR-040UK, which contains the Intel i5-2410M, and merely distinguishes itself from the reviewed device by a lower clock speed of 2.1 GHz. Merely the results of the Cinebench R11.5 benchmark give the TravelMate a very marginally higher score than the EasyNote. For applications that don't support multi-core calculations, the current i5 processor can definitely take it up with older i7 series quad-core processors: The EasyNote TS11-HR-158GE adopted for the Intel Core i7-2630QM for example, managed to score only slightly lower scores in the same benchmarks. In order to determine the overall performance of the notebook, we put the EasyNote through the comprehensive benchmark routines of PCMark Vantage and PCMark 7. In this case the result of 6437 points achieved by the EasyNote TS13 also slightly trumps that of the TravelMate, which is equipped with the identical processor and graphics solutions. The EasyNote TS11-HR-040UK is clearly beaten by about 1000 points in the PCMark Vantage benchmark, but is slightly ahead of our reviewed device with 2158 points using the current PCMark 7. Compared to the TS13, the TS11 doesn't contain an additional dedicated graphics card though, and merely has the integrated Intel HD Graphics 3000 available, which is noticeably weaker for use with 3D applications than a dedicated graphics card. Considering the price range, the EasyNote TS13-HR-197GE is relatively well equipped by current standards with its mass storage capacity of 640 GBytes. With this it should be possible to accommodate a small music collection or video archive on the notebook without any problems. The adopted hard drive is made by Western Digital, and has a rotational speed of 5400 revolutions per minute, which is common and sufficient for mid-range devices. The average read rates of about 67.7 MB/s are therefore reasonable and similarly unspectacular. The access time of 19.6 milliseconds is also not earth moving, and lies within the expected wide mid-range. As already mentioned, the Packard Bell EasyNote TS13-HR-197GE has two graphics solutions available. One of these is the Intel HD Graphics 3000 integrated into the CPU, while the other is the dedicated Nvidia GeForce GT 630M graphics card with 2 GBytes of DDR3 memory. The latter is a good mid-range graphics card with 96 unified shaders, which is based on the current Fermi architecture, and supports DirectX11 as well as OpenGL4.0. The GT 630 is based on the same chip as the GeForce GT 540M, which can be seen from the identical specifications: Both provide a GPU clock speed of 672 MHz, as well as a 900 MHz memory clock speed. These naming conventions are no novelty when it comes to graphics cards. Using the graphics benchmark 3D-Mark, the notebook is more or less on the same level as its competitors, such as the Acer TravelMate 5760G-2454G50Mnsk, and the Packard Bell EasyNote TS11-HR-158GE - all these notebooks contain the same graphics chip. The predecessor EasyNote TS11-HR-040UK, which is restricted to the integrated graphics solution, lies expectedly far behind with its result. These relatively decent values from the graphics benchmarks make us curious about the results of the gaming performance of the notebook. Starcraft II may not be the most demanding game in terms of performance, and is already a little dated, but is nevertheless still popular. In addition, it is always a good indicator for whether notebooks are suitable for gaming at all. With the GeForce GT 630M there were no doubts in this respect though: Even with the native resolution, and high graphics settings, the strategy game still runs smoothly with an average of 31 fps. The frames per second were also tested with the more demanding DirectX11 game Deus Ex Human Revolution. Especially for a first person shooter a smooth gameplay is essential. Using our minimal settings the game was reduced to DirectX10. The difference may be noticeable, but nevertheless results in a thoroughly playable 60 fps. The EasyNote TS13-HR-197GE is ideally suited for occasional gamers - although with limits and compromises. Notebooks that we can recommend for gaming without any qualms would contain a Geforce GT 555M, GTX 560M or higher performance graphics cards. The device emits relatively few audible noises - at least as far as the subjective impression during the practical test is concerned. The cooling fan may often turn on, and is also audible when paying attention, but is overall relatively quiet. This is also confirmed by the measured values: Without a high processing load, such as when working with office or similar applications, we measured a maximum hardly audible 32 dB. 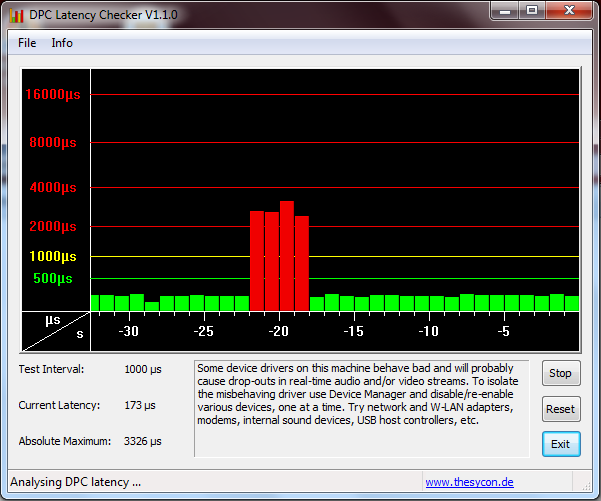 And also with 36 dB, the device doesn't generate an annoying system noise while playing a DVD. Even with a consistent processing load, we didn't measure a noise level over 40 dB, something that does however have a negative impact on the temperatures generated. Even the included hard drive from Western Digital is hardly noticeable when being accessed. And thus the troika becomes undone: A high performance graphics card with a quiet and thus relatively ineffective cooling system, results in a relatively warm case. During a constant CPU load we measured temperatures of up to 45.7 degrees Celsius on the bottom in some places, which would certainly make mobile gaming sessions with the notebook on a lap get uncomfortable. Around the palm resting area the temperatures remain within limits at 36.2 degrees. During office use the device stays pleasantly cool though. A notebook that is adapted for the private requirements of users at least needs a half decent audio quality. While models in the lower price segments not only fail in terms of the audio quality, but also in terms of the volume provided, audiophiles will be able to take some pleasure from devices for between 500 and 1000 Euros. The two speakers in the EasyNote suffice for day to day music listening and video/DVD watching though. Nevertheless they still lack high frequencies, similarly to other notebooks in this price range. Describing it as a "telephone sound" would definitely not be appropriate in this case though. Here another advantage of the graphics switching solution comes to light: In an idle state and when less demanding applications are used, the frugal integrated graphics unit leads to a low power consumption. With a variation between 7.9 and 10.6 Watts, the performance is more or less the same as of comparable devices. The high power consumption under a high processing load on the other hand, of up to 83.6 Watts, results from the active Nvidia GeForce GT 630M, which is already quoted for having a maximum power consumption of 35 Watts. With a maximum power consumption of 90.06 Watts, the provided AC adapter should just about suffice for its requirements. The results of the BatteryEater tests confirms approximately confirm the measured values. The EasyNote TS13-HR-197GE is powered by a 6 cell Lithium Ion battery, which can be charged to a capacity of up to 47 Watt hours. BatteryEater provides two performance tests, with which it is possible to test both the maximum and minimum expected battery life: With the Classic Test the notebook runs using the maximum performance, whereby the reviewed EasyNote TS13 lasted for 1 hour and 26 minutes. The Reader's Test simulates reading of text, whereby the lowest brightness level was selected, and the WLAN module was disabled. Thanks to the use of the frugal graphics unit, the device lasted for 6 hours and 58 minutes. So, the battery life is almost 7 hours. Using the power saving profile with the display brightness adjusted, the battery life was tested while surfing the internet via WLAN, and also playing back a DVD. During the Surf Test different websites are loaded, and some YouTube videos are played in between - in this case the EasyNote battery life lasted for 4 hours and 35 minutes, which is almost identical to that of its direct competitor, the Acer TravelMate 5760G-2454G50Mnsk. These results are relatively common for devices in this price and performance class - not least also because mobility is not exactly a high priority for 15 inch notebooks. Those placing a higher value on the battery life, should take a closer look at (usually more expensive) subnotebooks, which can achieve longer battery runtimes with the same performance, due to having smaller displays. The Acer Aspire 4830GT for example, has a similar Intel i5 processor and the same graphics card, but lasted 6 hours and 28 minutes in the Surf Test (although with a larger battery), amounting to a whole 2 hours more. A lot of performance and a long battery life: Is this the thorough success with a red case? A clear No. Of course the EasyNote TS13 will make private users happy, when they can play games smoothly, and also have a notebook with a decent battery life on the move. The red marker wasn't only used for the case though: As an all-rounder, the red notebook is still missing Bluetooth, USB 3.0, and a matte display. The notebook also quickly gets hot with a high processing load, something that can get unpleasant while it is used on a lap. When it comes to the contained hardware, there haven't been any savings though. The included Intel i5 processor, as well as the dedicated GeFore GT 630M graphics card, are both solid mid-range components, and combined with the 640 GB hard drive as well as 4 GBytes of RAM, the EasyNote is well equipped for the day to day requirements of a private user. The Packard Bell EasyNote TS13-HR-197GE is currently on the market for just under 600 Euros, which amounts to good value for money considering its contents. Dampers on the display frame. The bottom of the EasyNote. Access to the hard drive, WLAN module, and RAM. The battery slot on the EasyNote. 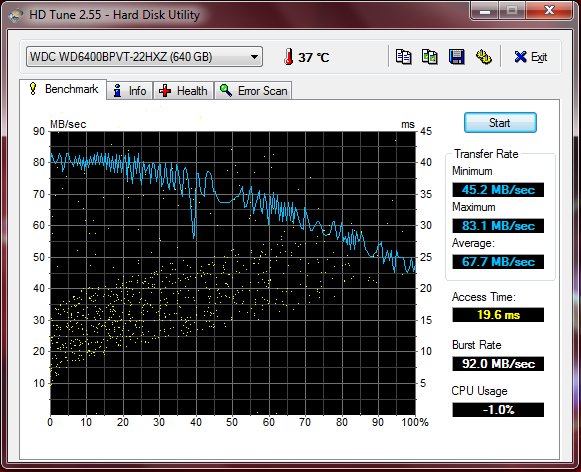 WD Scorpio Blue with 650 GB and 5400 rpm. The 4 GB RAM module. The WLAN module supports 802.11b/g/n. To remove the battery, some help is required. ...provides room for a UMTS module, although there is no socket available. The hinges are relatively stable. Volume control and Social-Media button. the keyboard and palm resting area remain matte. A numeric keypad is also included. 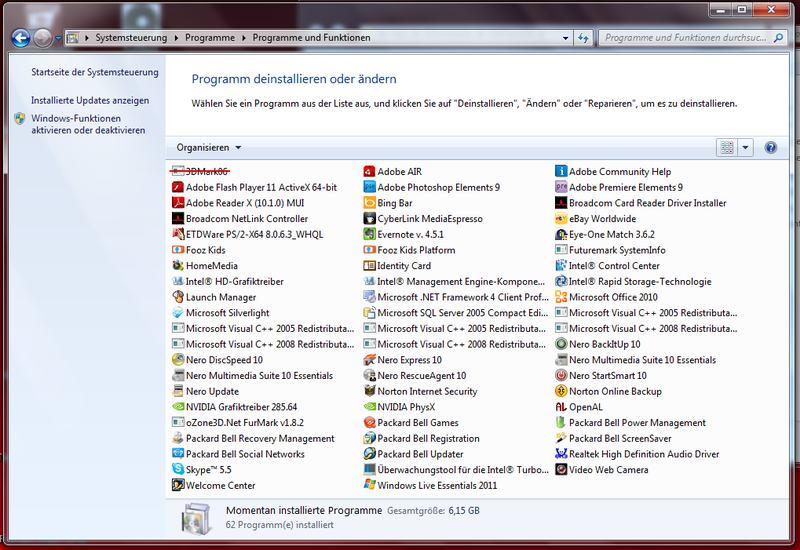 Windows 7 Home Premium is pre-installed. A short data sheet about the hardware. VGA, HDMI, USB, and audio sockets. Status LED on the front left. As standard the hotkey functions are active on the EasyNote instead of F1-F12. The arrow keys are set apart. 6 cell Lithium Ion battery with 47 Wh capacity. Good performance along with good battery run times. Bluetooth, USB 3.0, and a matte display. The good retail price of under 600 Euros with the CPU/GPU combination. The Acer TravelMate 5760G-2454G50Mnsk has the same CPU and GPU, and is a direct competitor for the EasyNote TS13-HR-197GE.